That's a pretty big headtube, what is it, about 60 c-c? I would say that should have a Cinelli 1-A or 1-R, or maybe a 3TTT quill, which should be able to get the bars in about the same place. You could also call that a Mount Special, after the great American George Mount. He was a domestique on Saronni's team, and because he rode the exact same size as Saronni, his job was to stay close in case Giuseppe had a mechanical and needed a new bike. Head tube is 6-7/8" [175mm]. It is a 61 pretty much. 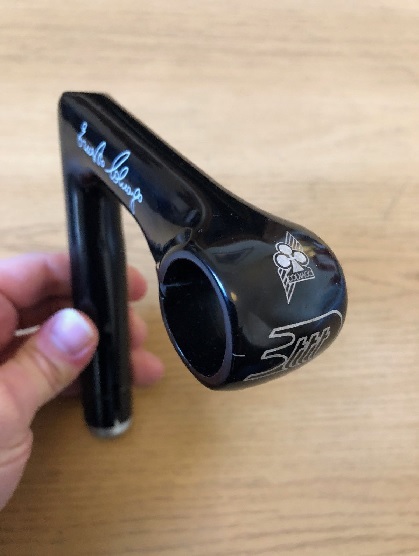 BTW, the original stem was a Black 1R engraved and filled et al. It was so flexy I did not like yanking and banking on it. It was beautiful though. A 3ttt Record 84 would look good too. Am I the only one here who owned a Saronni? 1982 - Scuttlebutt was they were made after hours in the Colnago plant. I liked it, at the time it was my favorite. Spent a few hours out on the Nago today. The ergos of the ERGOs is far superior to the Mirage 8s and Record 9s ERGO bikes I have had. I have a tendency to slightly overshift and hold a split second on STIs on upshifts. The ERGOs wanted no part of that. I do that on STIs as I keep the cable slightly loose for snappy downshifts due to their one click one cog nature.